There is a very big anomaly in New Zealand with regards to law firms , they are not readily identifiable and even the law society has trouble telling you what is a law firm and what is not a law firm. You wont find it on the companies register and even the registration on the solicitors roll is deceptive as the address is in Auckland and the phone number is in Alexandra. Also you have to wonder how an organization can operate from a Po Box. .. bit cramped we would have thought . Try to physically locate it and you will never find it as the ” organisation ” doe not exist and it is indeed a fictional law firm . Now this fictional law firm came about apparently through the ” merger” with Equity law . Now the objective of this blog post is to identify who or what Equity law is .. I warn you you are going to get dizzy . We had rather foolishly thought that equity law was equity law barristers as all the signage in the building indicate equity law as being inthe building and when our director had close relationships with the law firm it appeared to be a law firm . These two persons are also involved in the legal action against us . Action was originally taken agaisnt a member and when the plaintiffs agreed it was an error they eventually submitted proper documentation which shows the other plaintiffs signatures. to us it appears that a law firm has been set up using fraudulent signatures. But could it even have been a law firm ? seems like no one can tell us. Now The director of the firm claims that Equity law is a trading name he used. so the plot thickens. perhaps we will never know. Lu Zhang, 28, is accused of 75 offences of making false statements in company registration forms after she declared her office address was her residence in 75 companies she registered. She was charged after a plane loads of weapons, including rockets and grenades, from North Korea bound for Iran was seized in Bangkok last year. “Former fast-food worker Lu Zhang, 28, was the sole director of Queen St registered SP Trading Ltd, a company that hired a plane discovered at Bangkok airport last December flying 25 tonnes of arms from North Korea to an unknown destination, believed to be Iran. Zhang pleaded guilty yesterday to 74 charges of giving false residential information to the Companies Office, which registered multiple companies with her as a director. She could have faced up to five years in jail and/or a fine of $200,000, but was convicted and discharged. The fourth Floor of 44 Khyber pass used to be just the law firm and the travel agent next door but now we have a raft of activity there including forex traders and Equity trust International which sets up new Zealand companies for foreigners . The instructing solicitor in the action against us is Greg Stewart , although he works in Alexandra he is the director of this company and also supervised Julia Leenoh from his desk in Otago . we have now got a most confusing situation where by the court papers filed Greg Stewart claims that Equity law barristers limited was not the law firm called equity law in one lot of proceedings and claims that it was in another lot of proceedings. they have been served on the lawyer who is appearing on the matter and who has been signing the submissions but refuses to file a representation . 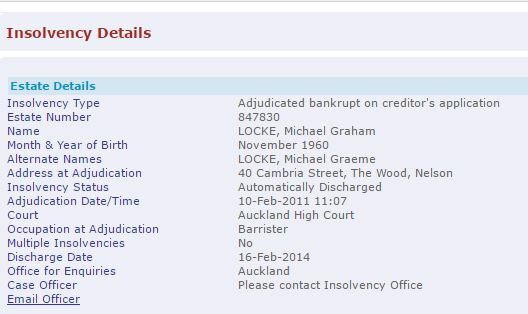 this is Michael Locke we believe he is the one and the same who appears on the insolvency web site having been recently released from bankruptcy . our revelations that the former lawyer did not have a proper law firm, and the fact that the associated trust firm passes itself off as a ;w firm is of concern. as are the mention of 10 million dollar bank accounts, solicitor escrow accounts and the offer of passports from the Dominican republic, St Kitts and Nevis as second passports to open up the world for would be investors. Interesting holiday reading of what he world so called second least corrupt country facilitates. We stand by our research the truth is the truth . Transparency International New Zealand will you unmask the corrupt ? 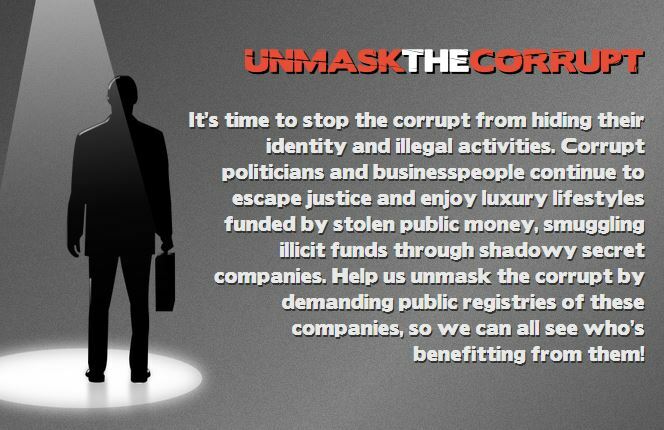 Transparency International are running an excellent campaign called Unmask the corrupt .Ironically this is what we have been doing and have been sued for , that is because we have been doing it on our own. There is a vast difference between Transparency International and their NZ branch , The New Zealand branch dedicates it web site to showing how well we are doing at being ” corruption Free” while the rest of the world actually fights corruption. We often point out that if you ignore cancer you will succumb to it , the same is true of corruption. We have New Zealand companies involved in international trade, not all of it legitimately see this news item. New Zealand: Pseudo-Financial Companies, and GT Group, Both Still Going Strong. This company overseas companies and has a disproportionate Russian representation . Even many of the people involved are what we call name shifters and so are the companies themselves , this is so that you never really know who you are dealing with . So needless to say we whole heatedly support the initiative of Transparency International in the UNMASK THE CORRUPT CAMPAIGN .